It’s not been the best end to Jan 19 with the loch frozen now for around 10 days and there seems to be no improvement forecast for the next week at least. We’ll update both our Facebook page and the website when it does. 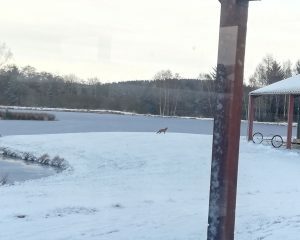 While we’ve had no anglers, we have had a visitor that keeps appearing from time to time – a fox. It’s obviously searching for some food and maybe obtaining some from the odd pheasant that we see. However, I’m sure he, or she, will be looking to relocate sometime soon with lambing just around the corner!